One of the strengths of the Conservancy lies in its ability to accomplish multiple resource restoration and public access objectives. 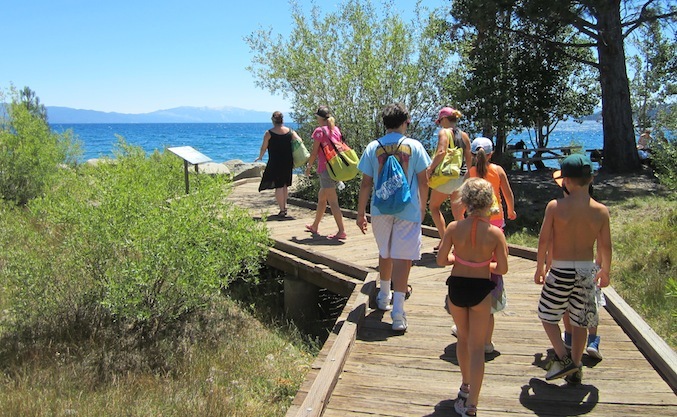 The Carnelian Bay Lake Access and Resource Enhancement Project is one of many Conservancy undertakings that have both reestablished natural processes and improved public access to Lake Tahoe. In the late 1980s and 1990s, the Conservancy acquired 13 separate parcels totaling just over seven acres and over 1,000 feet of shoreline in Carnelian Bay on Lake Tahoe’s North Shore. This area, a former wetland, had been covered with up to five feet of fill to accommodate commercial and industrial uses. The project removed more than 10,000 cubic yards of material to reestablish wetland function. Two large arch culverts placed under North Lake Boulevard (Highway 28) link the site with the adjacent wetland to the north, creating a continuous wetland habitat corridor. For the project also improved access to Lake Tahoe. A number of public amenities, including pathways, benches, picnic tables, barbeques, parking, restrooms, and a car-top boat launch were constructed, replacing older commercial properties. In addition, through coordination with neighboring businesses, access to day use mooring buoys, a pier and a beachfront trail is now available to the public. Today, the Carnelian Bay Lake Access Project models public-private partnerships in action. At Carnelian East, a concessionaire, Lake Tahoe Waterman, Inc., operates Waterman’s Landing offering a care and paddle board mecca for North Shore recreationists. At Carnelian West, Gar Woods Grill and Pier not only shares the parking lot, but also maintains the Conservancy’s recreation investments (restrooms, landscaping, wetland basin, pathways and picnic sites) for public use and enjoyment.